Good Par 5 here. Fairway bunkers squeeze the landing area putting a premium on the tee shot. Careful with the lay up also as the back right hole location can be tough to get to. Short par 3 plays a little down hill. Club selection is key with the 3 distinct tiers on the green. Watch your angle off the tee here. You can run out of room on the right if you are not careful. Make sure you have enough club to clear bunker front right if the pin is on the right. Great short Par 4 here. Pick your poison of the tee but trouble looms right and left. 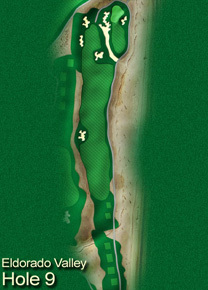 Big ridge splitting the green into right and left may cause problems if you are on the wrong side. Toughest hole on the El Dorado course. Tough driving hole with the arroyo running down the right side. Approach plays a little down the hill so choose your club wisely. Dog leg left Par 4. 3 wood may be best off the tee as the straight ball may run through the fairway with driver. Approach is more uphill than it looks. Down hill par 4 with plenty of trouble. No room to the right of green so be careful. The wind can swirl on this Par 3 so pay attention. Middle of the green is always good here. Long, up hill par 5. Avoid bunker on left side off the tee. Choose which approach area to lay up to or dig deep to reach in 2 shots. Beware of bunker running across lay up areas.